Josh grew up in various locations within the United Kingdom and Europe as part of his military upbringing. 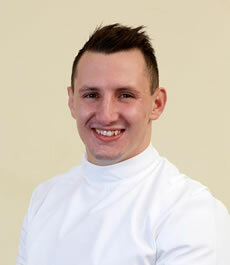 Josh attended Worksop College before training at Leeds Beckett University to complete his Master’s Degree in Osteopathy. Josh is keen to treat a wide variety of patients; from younger sportsmen to the elderly. During an Osteopathic consultation with Josh he will not just focus on your specific area of pain, but will assess you with a whole-body approach. This will allow Josh to both treat and offer advice on factors which may be impacting your ability to recover, such as posture or exercise habits and provide you with individually tailored exercise routines. Josh will also provide you with several approaches to treatment if appropriate so that you may help make decisions about your healthcare. Alongside Osteopathic treatment Josh is also qualified in Medical Acupuncture, advanced level kinesiology taping and Cranial Osteopathy. During his University career, Josh continued to develop his interests in encroaching the gap between elite sports and Osteopathy; becoming a member of the Osteopathic Sports Care Association, attending sporting Masterclasses and treating competitors of the World’s Strongest Man competition. Osteopathy is a system of diagnosis and manual treatment focusing on the structural integrity of the body. That is, the skeleton, but also the muscles, tendons, ligaments and other soft tissues that are intimately related; pain so often being caused by the protective reaction of a muscle to misalignment and restriction in the small facet joints of the spine or to the minor displacement of other joints in the upper and lower limbs. Misalignment in one part of the skeleton will often affect and place undue stress on other parts. For example, a restricted / misaligned pelvis may cause apposition problems in the hip joints, tracking problems through the knees, uneven weight bearing through the lower limbs, apparent leg length discrepancy as well as a lateral curvature of the spine. The result can be pain and other symptoms arising from joint compensation, muscle spasm, tension or nerve root irritation.